Odegal Basti on Indragiri Hill at Shravanbelgola is one of the very unique structures. Built in 14th century this shrine stands on a lofty terrace with a high flight of steps leading up to it. As stone props are used for strengthening the basement walls the shrine has been called by the name "Odegal Basti". It is a fine granite structure of the Hoysala period. The temple has a plain exterior. It is the only triple shrine temple in this area that has three sanctum facing different directions with common hall between them. 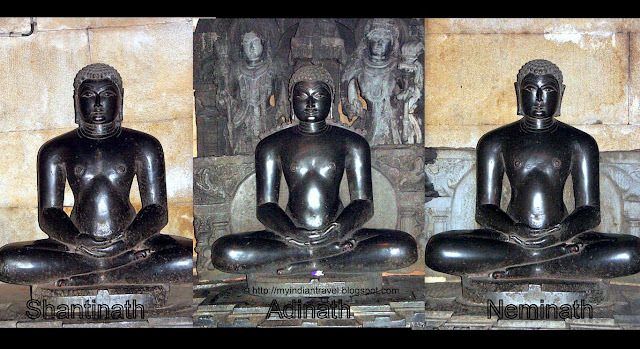 In the 3 sanctums are beautiful images of Tirthankara carved in schist. The main cell contains a fine figure of Adinatha flanked by male chamara bearers, the left cell has a figure of Neminatha and the right a figure of Shantinatha. The veranda has beautifully shaped pillars. Another view of the Basti. Cool post Rajesh.. I would like to visit there.. just wanted to know how far it is from Bangalore and did you enjoy your trip!!! Bom dia, peço desculpa por não conseguir a tradução, comento as imagens que são maravilhosas e que me transporta para a historia do belo lugar. Hello, wonderful post and visit to the temple. The carvings are beautiful.Happy Monday, enjoy your new week ahead! The statues and the temple are beautiful. The steps remind me of Rock Fort in Tiruchi, India. Nice photos and share, Rajesh! the three carvings are so lovely, I would love to see something like that. Beautiful sculptures and very unusual pillar.....looks Cubist! Your pictures are always wonderful..all the best..! The pillar is gorgeous. Those steps are very steep - I'd be keeping my focus on balancing! Again, you've shown us such an interesting - and beautiful - destination! looks like a bit of a hike! Shravanbelgola is very famous place . Beautiful pictures are saying lot of words ! !